Update: Favorite websites, Full Dropbox Integration, Manage posts and pages, Access to new cool tools and a promo code for WPMU! It’s been almost a month since our last update and today we are bringing a wealth of new features. We are also working hard on a completely new design of the user interface, which btw you can get a sneak peak of here. Everyone has couple of websites that they love and cherish the most, and this new feature allows you to keep these favorite websites closer to you. Simply drag&drop a website to the small hear icon on the top and you will add it to the favorites bar. The site will be shown by it’s favicon so make sure you have one for the website. 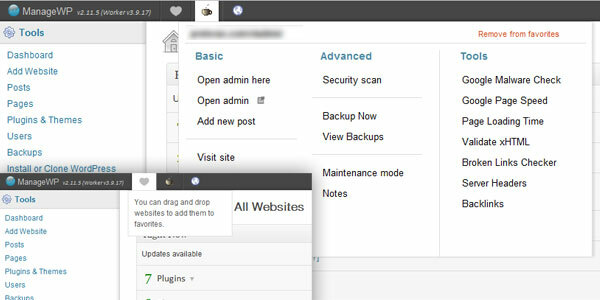 We have a new menu assigned to the sites and it’s loaded with new free tools to easily check your websites. Among the tools are Google page speed which tells you what elements on your website can be improved and the Security scan to check your websites for malware (in association with sucuri.net). Specially for this occasion they provided all ManageWP users with a 40% discount code to access their entire selection of premium plugins. To use this promo code click the image below. 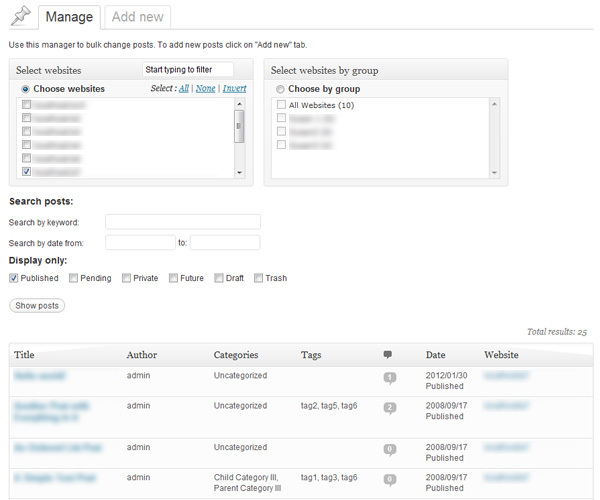 We have expanded the Bulk add post and page functionality to manage your posts and pages in bulk too. We now support Dropbox through Oauth protocol which means you no longer need to type in your Dropbox login details. Just authenticate once and use Dropbox to save your backups. This also allows you to restore backups directly from Dropbox. We can also comply to the backup number limit you specify in the backup task. The old backups will still work. The setting to Authenticate with Dropbox is found under “Settings”. Our entire user guide is now downloadable as PDF! In the next week we expect support for Gravity Forms and Catalyst theme, two very popular premium products for WordPress. We also have the new dashboard design in the works. If there is any new feature you’d like to see in ManageWP soon please let us know in the comments or use our Ideas section on Google Moderator.